Naomi is from BC, Canada, but currently lives in Hong Kong. She studied fashion in Melbourne, Australia, and London, England, and for 4 years she worked as a fashion designer in Hong Kong. For the past 3 years Naomi has worked in marketing and design and spends most of her spare time designing items for her Chopcookdine label. Currently all Chopcookdine's products are homemade in her Hong Kong apartment, with hope of manufacturing them once there is demand. Naomi started learning to cook, from her mother, at the age of 4; the first meal she made was tuna wiggle - pasta, tuna, mayonnaise, and dill, all mixed together. Her cooking has continued to evolve since then. 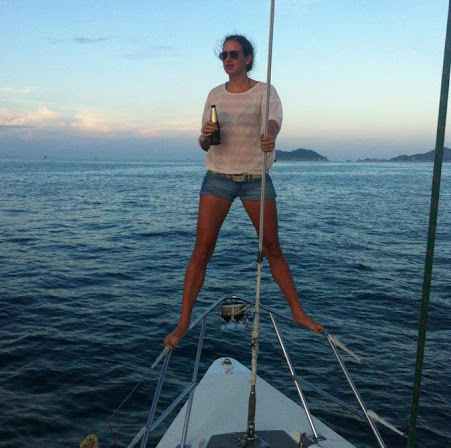 Naomi's cooking experience includes working as a cook and deckhand on sailing boats in the Whitsundays, Australia, as well as working in a deli and bakery, and as a bartender. Naomi's inspiration for cooking derives from her travels and experiences.